Years ago, Tezzeret’s first planeswalker card made a near-immediate splash in Vintage, of all places. Not only is he a Tinker effect you could play four of, he can win games all by himself by sending 5/5 Moxes in your opponent’s general direction. That’s a pretty high bar, and I don’t think that anybody reasonably expects later incarnations of Tezzeret to do anything like that. They stand on their own merits – the Artifice Master is less explosive, but is strong in the long game. A deck set up to take advantage of his talents and always have metalcraft, if you want to get Scars of Mirrodin on things, can use him as a card-drawing engine almost reminiscent of Jace the Mind Sculptor. Building up to his ultimate is pretty tempting, too: yes, that really is a Tinker effect that you can not only play four of, but is uncounterable and repeatable. You might not need more than one if you’re going straight for Blightsteel Colossus, but you can also assemble crazy combos with it. Might I suggest Darksteel Reactor? 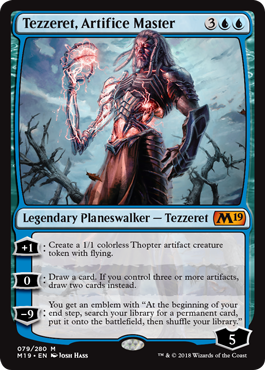 Tezzeret has always had a pretty defined mechanical identity as the artificer planeswalker, and this iteration of him is no different. Makes thopters, draws cards based on the artifacts you control…must be Tezzeret, all right. Despite being in the planeswalker “dead zone” of 5 mana, Tezzeret ticks two solid boxes: impact when he comes out, and an ability to protect himself. His +1 makes blockers/warm bodies and also pairs well with his 0, drawing a card with a bonus card if you have metalcraft turned on (three or more artifacts). In fact, Tezzeret’s 0 might be the big sell of him: two extra cards a turn is very worth it, his starting 5 loyalty is more than enough to keep him safe for a couple of turns (it’s out of reach on most kill spells), and you can flip to his +1 if you need to start preparing for the final push. His ultimate is Planar Bridge, more or less. Remember that janky mythic from Aether Revolt, that cost fourteen mana to get a thing out from your library? Well, here, it’s five mana and 5 turns after he drops (or immediately with Doubling Season, but few planeswalkers aren’t busted with Doubling Season), and it’s free every turn. It even happens on your end step, for what it’s worth, so it has a near-immediate impact! This is more an ancillary benefit than the core of the card, but it is there. Even without his Planar Bridge ultimate, Tezzeret is pretty solid all around. He might not make it in non-Standard formats…but, at least with Kaladesh and Ixalan running around, there’s room for the master of metal to make a mark, even as a card-draw engine.